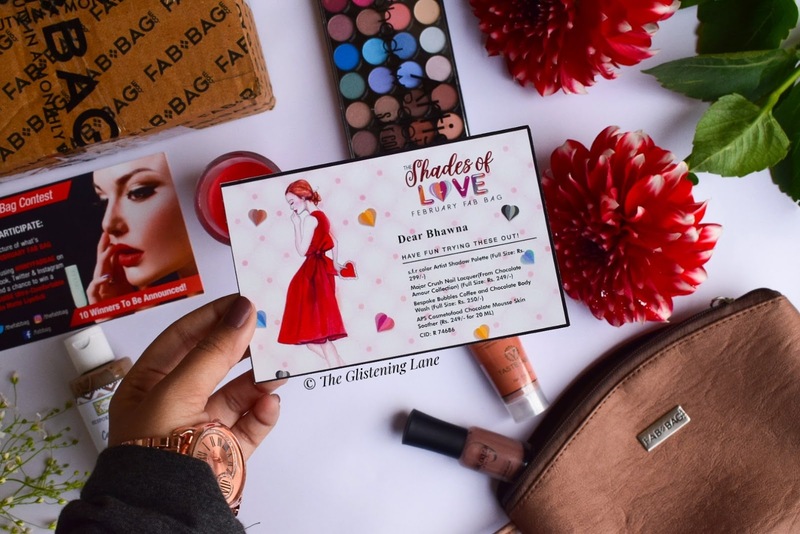 As you guys know, it’s the month of LOVE, I was super-excited wondering what would be inside February month’s Fab Bag. So, without further adieu let’s directly begin with the unboxing. In the month of February, subscribers will be receiving a combination of 2 Makeup and 2 Beauty Essentials. Please note that - No makeup choice is being offered to short term as well as long term subscribers for this month. Each and every subscriber will be receiving the same set of products which, I believe, is for resorting to the theme of LOVE and CHOCOLATE. 🍫 It took me some time to notice that a lot of the things inside the courier were in brown colour and most of them had a beautiful fragrance. 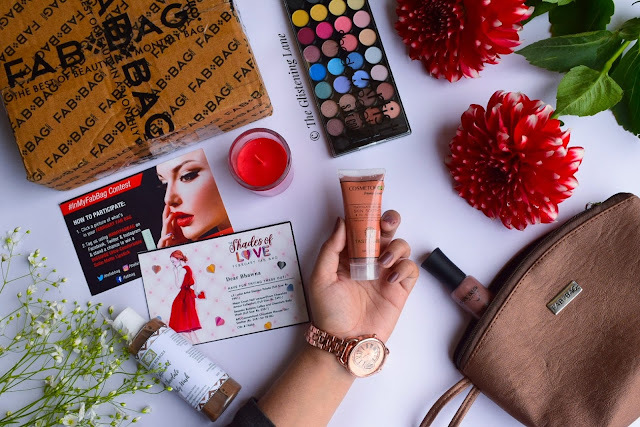 Going as per the festive trend of this month, the Fab Bag’s pouch this time is glittery brown in color. Personally, I feel it’s relatively more spacious and you can store a lot of your skincare or makeup products while travelling. Moreover, glitter chunks on the pouch are finely milled which makes it appear festive yet subtle for everyday usage. Also, there’s a small wristlet which can be used for carrying purpose but I don’t really like using them. When I received a text message from the team of Fab Bag that there will be no makeup product for this month, I was slightly worried if there will be any makeup product inside the bag or not. 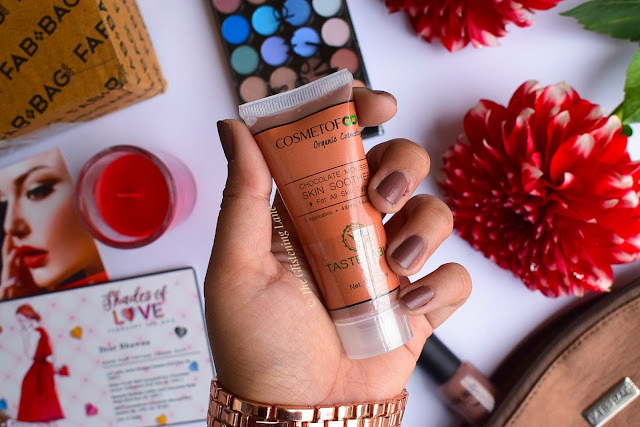 And then, I talked about the same with one of my favorite co-bloggers and we ended up thinking probably its one of lip scrubs which was recently launched by the brand Sugar. But while unboxing, I felt it could also be the newly launched Contour De Force trio. However, when I saw an eyeshadow palette, I was awestruck by some of the amazing colors that were inside the pan. As far as I know, S.F.R. is an inexpensive makeup brand whose eyeshadow palettes have been raved by a lot of Delhi bloggers. 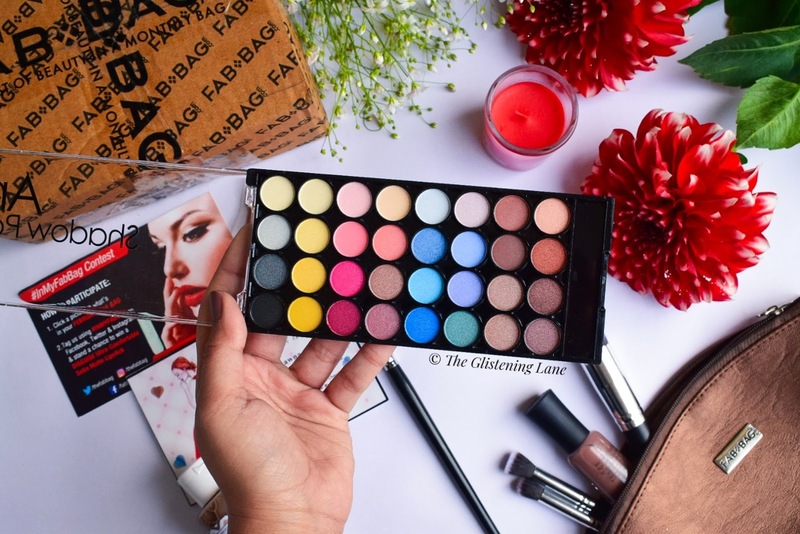 The packaging of this palette is quite sleek and you can easily toss it into your handbag or travelling bag without the makeup item taking a lot of space. I did use some of their brown shades but I’m really excited about trying out more looks using some of the vibrant colors! When I started ripping off the bubble wrapping from this product, I wasn’t really sure what beauty essential item would be inside. Gradually, my eyes noticed that it’s a beautiful chocolate brown nail lacquer from the brand Major Crush. 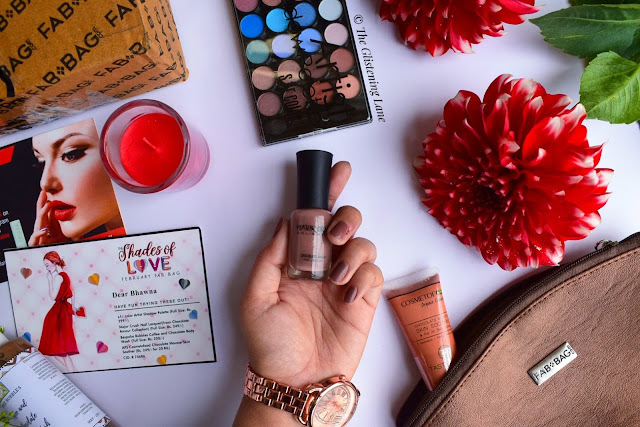 As far as my memory goes, I have tried their nail paints before which was also sent in one of the Fab Bag subscriptions a couple of months ago. I took me no convincing for getting rid of my older nail paint and applying a fresh coat of this one. While the color intensity is fine in the first layer itself, I decided to apply 3 layers for getting a perfect opacity and longevity on my left hand. On the other hand (like literally), I applies just a single coat of the nail paint and it started coming off on the next day itself. Therefore, I’d suggest you to go for two or three layers like me and it will last you somewhat 2-4 days in particular, depending on the type of work you do on a daily basis. On weekends, I love pampering myself using a couple of skincare and body care products. And as per the famous saying, you can never fall in love with others until you start loving yourself to begin with. Therefore, I take out some time for enjoying my company and probably humming to nostalgic songs in the bathroom with some lit candles. Though, I haven’t heard of the brand Bespoke Bubbles before but you guys know that I never mind trying out new products or brands. One thing which I noticed while showering tonight is that this body wash does foam a little but it’s not crazy foaming at all. This is one of the reasons why this body cleanser does not dry out your skin. 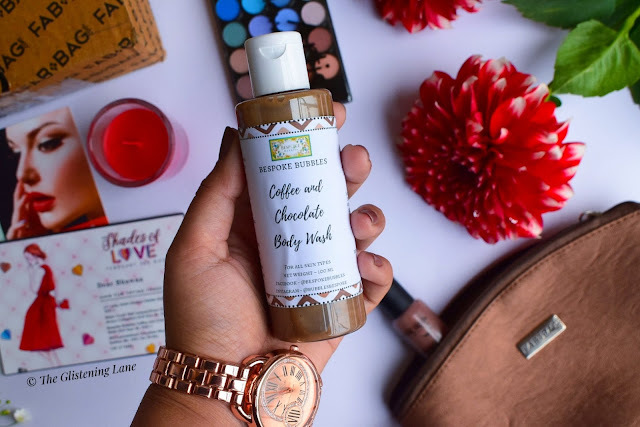 However, if you have an extremely dry skin then definitely use a body lotion post using this body wash.
Make sure to follow me on these social media channels: Instagram and Facebook. Eyeshadow in FabBag 😍 So Cool! That chocolate brown nail lacquer looks beautiful. And the chocolate skin soother is good too. I would say this month is a really good bag.